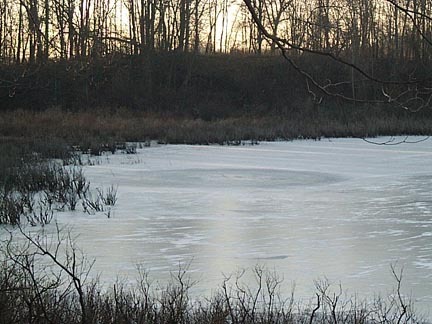 Ice circle discovered on December 28, 2003, by local resident Vaughn Hobe at Mud Lake in Horton, Michigan, about fifteen miles south of Jackson. Photograph © 2004 by Todd Lemire, Michigan MUFON. 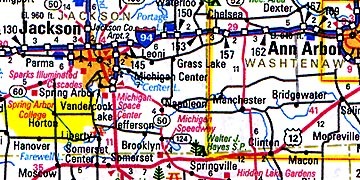 Horton, Michigan, in Liberty Township is about fifteen miles south of Jackson where the odd Mud Lake ice circle was discovered December 28, 2003, by Horton resident, Vaughn Hobe. January 16, 2004 Horton, Michigan – On January 3, 2004, Earthfiles.com reported about an “incredibly brilliant white light” that local resident, Vaughn Hobe, saw hovering over the hill above Mud Lake about a thousand feet from his house in Horton. When a large, nearly perfect circle was discovered in Mud Lake ice on December 28, 2003, many wondered if there was a link between the bright light and the ice circle. 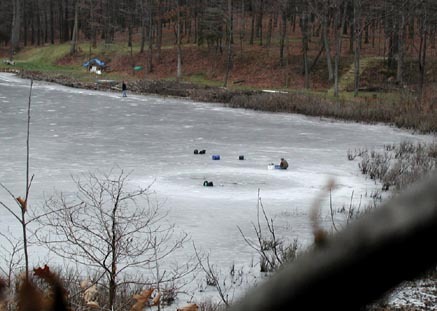 Some of the local residents say the cove end of the lake where the ice circle emerged has been called the “Devil’s Hollow” because people have seen so many strange lights there. In fact, over the past few years, near the same hill above Mud Lake, Vaughn Hobe has repeatedly seen large, orange glowing spheres at least 25-feet in diameter hovering in the sky. He says the orange is the color of a ripe pumpkin and that he has only seen one sphere at a time, never in groups. The closest approach was once about 200 feet away. The orange spheres have been stationary and then move off, seeming to dip down toward the hill beyond his house where he saw the bright, white bar of light on December 18, 2003. News about the Mud Lake ice circle did not reach investigators until Christmas Eve, December 31, 2003. The next day on January 1, 2004, the research team that went to Mud Lake included: Jeffrey Wilson, Ted Robertson, Dr. Charles Lietzau, Roger and Nancy Sugden, Zach Smith and Todd Lemire, Chief Field Investigator for the Michigan Mutual UFO Network (MUFON). The researchers reported there was a clear ice circle about thirty feet in diameter at the center. That ice was only about one-inch thick. The clear center circle was surrounded by a whitish-grey ring of thicker ice about four to five inches deep. Surrounding the ring was what the group called the “exterior edge.” The three sections of the ice circle measured sixty-two feet east to west and sixty-four feet north to south. To find out what the academic world knows about ice circles, I contacted an expert on inland waters who also studies ice and the patterns ice makes. He is John Magnuson, Ph.D., Professor Emeritus of Zoology and Limnology (study of inland waters), at the University of Wisconsin Center for Limnology in Madison. Through email, I showed Professor Magnuson photographs of the Mud Lake ice circle. The following are excerpts from an audiotaped interview done while he had the three computer images shown below in front of him. Horton, Michigan ice circle (62 x 64 feet diameter) found in Mud Lake cove about ten feet from reed bed on December 28, 2003. Photograph © 2003 by Vaughn Hobe. Thicker “splash pattern” surrounds thinner center circle. Photograph © 2004 by Ted Robertson. 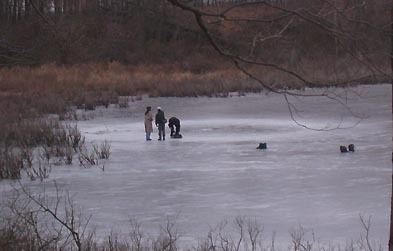 Mud Lake ice circle near Horton, Michigan, in Liberty Township, investigated on January 1, 2004. Photograph © 2004 by Ted Robertson. John Magnuson, Ph.D., Professor Emeritus of Zoology and Limnology, Center for Limnology, University of Wisconsin, Madison, Wisconsin: “You’ve raised two issues. One is a light on the horizon that could be anything and secondly, the fact that there was snow on the ice and then there was thawing. The way that grey ice forms typically is that you get melting snow on top of the ice and then that slush re-freezes. If you had this melting snow ­ let’s say that snow fell across the whole area and the middle area for one reason or another is open, then near the edge the water tends to seep out into the snow that is on the ice. So, that grey ice could have been caused by the re-freezing of that melted snow and that melting snow could be wetted from water seeping up from the open area. I haven’t seen something quite like this, but I’ve seen lots of holes through the ice and spent a lot of time on the ice in the winter. First of all, ice forms all sorts of interesting patterns. Snowflakes are beautiful. They have symmetry. In the spring, the lakes break up and form hexagons in the ice. There is a lot of pattern and physical structure to ice. This particular pattern (at Mud Lake), this ring, I really don’t know what it is caused by. I’m sure it’s caused by natural processes, but I don’t know what it is caused by. I haven’t seen one as big as this that has the larger dimension around it. The pattern ­ ice forms in two very different forms and variations in between. One we call clear ice and the other we call grey ice. Clear ice is when you have water freezing and it doesn’t have snow or slush. It isn’t broken up. It just freezes and that ice is often called clear ice or dark ice because you can look right through it. This ring that you are seeing has a ring of what we would call grey ice, which is not just plain frozen water like an ice cube. It also shows evidence of being mixed with snow or mixed with broken pieces of ice that formed around an open hole that piled up around the edges and then re-froze, so it’s not clear. It is in fact grey ­ or from these photos, it appears to be a white ice. And it is very symmetrical, this particular pattern and I had originally thought that it was a late-freezing area in the middle of the lake and wind action might have caused the grey ice ring as the ring broke up around the edges. But I think something else has kept the water open here. it would be a hole that was formed by a spring that would cause some vertical movement of the water to keep this area, the clear area open longer and the clear area then froze a few days or a week later than the area around the edges. Another possibility is that it might have been an area where a muskrat had pushed through and muskrats tend to do this when the ice is very thin. But for some reason, the center part of this ring did not freeze as early as the ring itself. Then a few days later, perhaps the next cold period, the center froze in what we call clear ice or transparent ice. Another possibility is that if they looked at the bottom structure, that the bottom structure might not be just flat. Consider the possibility that there might be a mound in the sediment, so that right where this circle is the water is shallow and as you go out from it, the water deepens a little bit in all directions. BUT FROM YOUR PROFESSIONAL ACADEMIC CAREER STUDYING WATER AND ICE, THIS IS AN UNUSUAL ICE CIRCLE? It’s a beautiful ice circle and it is unusual. 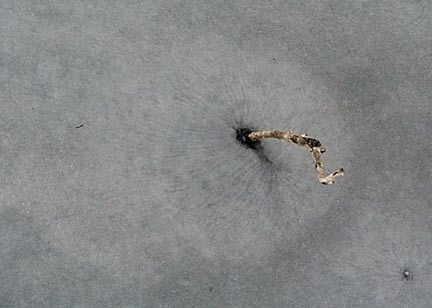 Close-up of one of about twenty holes found fifty feet north of the halo surrounding the ice circle at Mud Lake. They are all in an area of ten by twenty feet. Photograph © 2003 by Vaughn Hobe. Both the hole in the ice circle that has a plant stem marking it and another ice hole in the lower right have a radiating radial pattern. Only the holes in this small area of the ice circle had small dark spots visible in the photograph. Photograph © 2003 by Vaughn Hobe. Dr. Magnuson pointed out that methane bubbles might also explain several small one-inch diameter holes shown in the above photographs that investigators found in the ice circle. Methane bubbles are known to break open small holes in ice through which water can rise like little geysers, especially if there is snow weight on the ice. 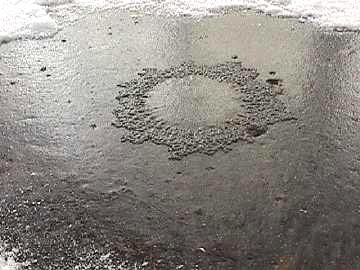 Water flooding into snow will create slush rings. In fact, Michigan investigator Charles Lietzau, Ph.D., who teaches biology at Mumford High School not far from Detroit, found holes in ice covered with snow on a lake near his home that were gushing water. Inspired further by the ice circle research of German crop circle researcher Andreas Mueller, who has documented many naturally-formed ice circles, Dr. Lietzau also did a backyard experiment to test the hypothesis that water spilling onto snow-covered ice creates a thicker ice layer. That’s what happened and the pattern was a ring, similar to the so-called “splash ring” at Mud Lake. Charles Lietzau, Ph.D., Biology Teacher, Mumford High School, Detroit Public Schools, Waterford, Michigan: “I found an area where the snow was very thin ­ maybe 1/8th of an inch at this point and uniform. I poured a small amount of cold water on to it to see what the results would be. Eventually the water spilled on the ice would cool down enough that rather than melting the snow, it would actually mix with the snow and form slush. This slush would be thicker than the ice underneath once it re-froze. It would be the addition of the wet snow on top of the ice underneath. That’s basically what happened. The water would dissolve a circular, smooth central circle and than at the very edge when it finally was unable to penetrate the snow or melt it, it was attracted into the snow by capillary action and it turned the edge of the ring to slush. Then eventually everything froze. The thickness of the slush was basically the thickenss of the snow cover. A day later after this whole trial had been covered by fresh snow, I cleared all the snow that had settled on the smooth inner circle and the snow that had always been beyond the splash ring and what I had left was a beautiful splash ring with the same pattern radiating outward in terms of the direction of deposition that we had seen at the circle at Mud Lake. Small scale experiment by Charles Lietzau on January 14, 2004, to see what would happen if a small amount of cold water was poured on a thin layer of snow and ice. 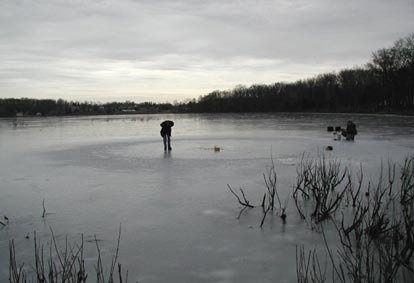 Result was 2-inch center circle of clear ice surrounded by an irregular ring of frozen slush, very similar to Mud Lake’s ‘splash ring.’ Photograph © 2004 by Charles Lietzau, Ph.D.
IS IT VALID TO MAKE A COMPARISON BETWEEN THE EXPERIMENT ON A TABLE TOP AND MUD LAKE? That’s actually a very good question. Eventually you’d like to approach things like this and do a full sized, full scale experiment. Now, that doesn’t leave out the possibility that there could actually be another source that melted an open circle and created some kind of surface disturbance. If you strike a bowl of water, little droplets jump everywhere. So something like that could possibly duplicate this effect. But what we are saying is that we seem to have evidence here that there are also natural systems that could account for it. Indeed this is very interesting in the sense that it is located directly under a sighting of a brilliant, dazzling column of light and the calculation of the distance involved and the estimated size indicate that the column of light had the same diameter as the circle (in the lake) and roughly in the same location as seen from roughly 1,000 feet away (Vaughn Hobe’s eyewitness account). The Mud Lake ice circle research in Horton, Michigan, has provoked an international collaboration on natural ice circle explanations. Further, there is curiosity about possible energetic interaction between the bright, white light and Mud Lake – the light that Vaughn Hobe observed on December 18, 2003, near the ice circle’s later location.